Andrew's Pipe Case Contents, June 2000 and February 2004. The original purpose of this page has been replaced by a more informative page on useful items to keep around for piping, so this page is more around as a novelty. Almost immediately after compiling the June 2000 list below, I started doing research for the page linked immediately above which resulted in me added some things to my pipe case. Toward the bottom of this page is my February 2004 contents list. You really have to decide for yourself what you want to keep where, depending on what you use when. What was in my pipe case as of June 2000. 2) Drone/Stocks Stopper Plugs. Used for plugging a drone to reduce air pressure required to play the pipes, i.e when breaking in a new reed. Also plugs for sealing the stocks when seasoning the bag. 3) Electrical Tape. For taping the holes on a chanter to reduce pitch for a given note. 4) Scissors/Pocket Knife. For cutting electrical tape and hemp cord. 5) Roll of Black Waxed Hemp. For wrapping connecting joints on the pipes, i.e. chanter in its stock, drones in their stocks, drone sliders. 6) Roll of Yellow (Unwaxed) Hemp. This is easier to unravel, good holding the chanter reed in place as it is often times raised and lowered in the chanter. 7) Beeswax. Good for quickly fixing a loose joint by rubbing on the hemp and building it up when you don't have time to rewrap it with hemp. Also can be used to turn a chanter reed in to a stopper plug by pushing the reed into a chunk of wax—of course, you wouldn't want to do this with a good reed! 8) Safety Pins. Used for holding on kilt number sheets assigned for competitions. 9) Waxed Dental Floss (Unflavored). Used for the "fine tuning" of the pipe joints when the waxed hemp is too thick, but you need it just a little bit tighter. Don't make the joints too tight, or you can split your pipes. 10) Tiny Rubber Bands. For use as bridles on practice chanter reeds. Make a reed higher in pitch and easier to blow. Bands designed for use by Orthodontists work great. 11) Extra Drone Reed Tongues. If you are using a set of drone reeds that have easily replaceable tongues, such as Shepherd Plastic Drone Reeds, you should have back up tongues. 12) Cleaning Swabs. Used like a giant single ended "Q-tips," these look like a bottle bush. Used to wipe out your drones, chanter, whatever. Just avoid getting bag seasoning on them. 13) Earplugs. I recommend a good set of musician's earplugs. These block just a portion of the sound. I swear by them. I don't want to be a hard-of-hearing old piper when the time comes. 14) Miscellaneous Correspondence. A few things from the piping association just for kicks. Most of it I keep elsewhere. My association membership I.D. card is in my wallet, for instance. 15) A Bottle of Water. In my case, Perrier, from my sister-in-law's wedding I played at. Hmmm. Reminds me, that bottle's got to be pretty stale. 16) Owner Information. I've got a business card in there so people know how to contact me should my pipe case wander off. My case also has an engraved plate on the outside with my name and city, state, country on it. 17) Stuff. A couple recent piping related receipts. The key to the case lock (never use it). Some old receipts my grandfather kept in there. 18) An Extra Pipe chanter. My non-band issue wood model. 19) Extra Chanter/Drone Reeds. Never know when these might come in handy. Elsewhere. I've got another bag/satchel for keeping a tape recorder (with extra batteries and tapes), sheet music, practice chanter, snacks, newletters, articles, more reeds, notebook, pen, bore oil. What was in my pipe case as of February 2004. I didn't do anything special here, just opened my case, removed my pipes and took a picture, so this is authentic. 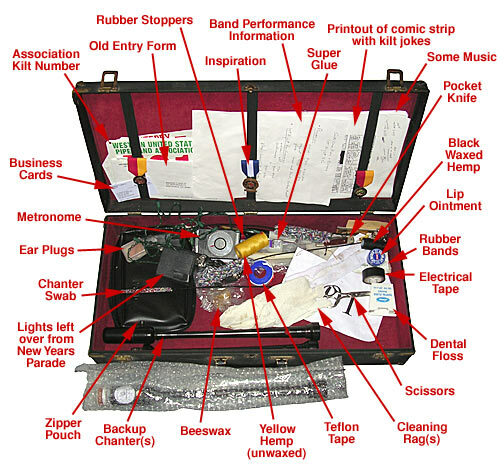 There's some other stuff tucked in there too that's not labeled: case key, safety pins, pen, drone swabs, etc. The zipper pouch contains extra reeds and other more sensitive or easy-to-lose items. The Christmas lights would have been already returned to the band, but I broke—or cracked—my left ring finger playing football in early January 2004 and as of mid-February was still recovering. Believe it or not, yes, my pipes do actually fit in this case too! Page first added to the site on June 26, 2000.